American bombers A-20 Havoc bombed the Japanese airfield with parachute bombs. 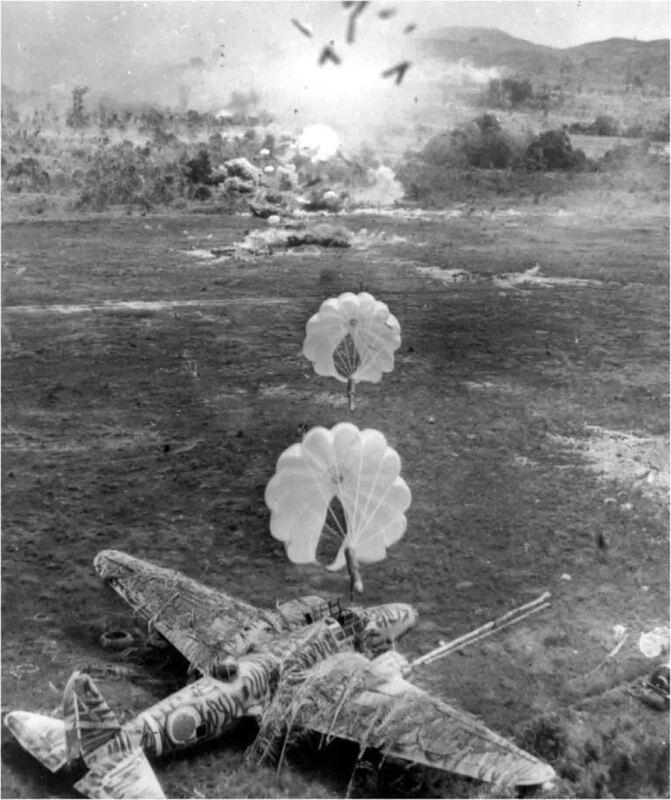 The picture was taken a second after the fall of one of the bombers (in the background). In the foreground is a partially dismantled Japanese medium bomber Mitsubishi Ki-21-IIb. Aero-node in the Dutch East Indies (now Indonesia), the work of the 499th, 498th, 500th and 501st bomber squadrons on the B-25 and 90th squadron on the A-20 Havoc with the support of P-38J and P -40N of the 5th Air Army of the US Air Force. The Japanese army air mission was almost completely destroyed (about 250 aircraft destroyed or seriously damaged), the raid was well prepared and secured, was completely sudden, air defense suppression was ensured.